By recommendation of my awesome girlfriend, who brought this lovely album to my eyes just today. Mostly overlooked (though still generally regarded as a classic) "transitional" album my Joni Mitchell. This is where she first gets the ideas to start embracing the jazz influences that dominated her later work. Nice combination of folk with slight jazz touches. 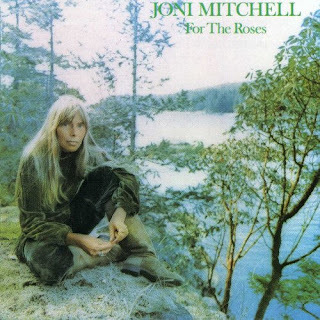 On For the Roses, Joni Mitchell began to explore jazz and other influences in earnest. As one might expect from a transitional album, there is a lot of stylistic ground explored, including straight folk selections using guitar ("For the Roses") and piano ("Banquet," "See You Sometime," "Lesson in Survival") overtly jazzy numbers ("Barangrill," "Cold Blue Steel and Sweet Fire," and hybrids that cross the two Let the Wind Carry Me," "Electricity," "Woman of Heart and Mind," "Judgment of the Moon and Stars"). "Blonde in the Bleachers" grafts a rock & roll band coda onto a piano-based singer/songwriter main body. The hit single "You Turn Me on I'm a Radio" is an unusual essay into country-tinged pop, sporting a Dylanesque harmonica solo played by Graham Nash and lush backing vocals. Arrangements here build solidly upon the tentative expansion of scoring first seen in Ladies of the Canyon. "Judgment of the Moon and Stars" and "Let the Wind Carry Me" present lengthy instrumental interludes. The lyrics here are among Mitchell's best, continuing in the vein of gripping honesty and heartfelt depth exhibited on Blue. As always, there are selections about relationship problems, such as "Lesson in Survival," "See You Sometime," and perhaps the best of all her songs in this genre, "Woman of Heart and Mind." "Cold Blue Steel and Sweet Fire" presents a gritty inner-city survival scene, while "Barangrill" winsomely extols the uncomplicated virtues of a roadside truck stop. More than a bridge between great albums, this excellent disc is a top-notch listen in its own right. Definitely agree that this is an album of transition, but I wouldn't quite call it a classic...just reviewed it on my music blog. Thanks for sharing!